Eilat is blessed with the most amazing and unique coral reef in the world, with an underwater marine observatory situated in the heart of the reef. The park offers its visitors a rare opportunity to enter the natural and abundant marine kingdom of the Red Sea – an unforgettable experience for both young and old. The park has a spectacular display (over 800 species) of fish, coral, sharks, mollusks, stingrays, turtles, and many other animals from the Gulf of Eilat. and, the most unforgettable place of all – the Underwater Marine Observatory, the only one of its kind in the world! The observatory is a tower situated in the middle of the sea, without any fences or cages, offering a rare view of the Red Sea, with its bright colors, tones, and the marine life in the Gulf of Eilat. The tower is comprised of two display halls. 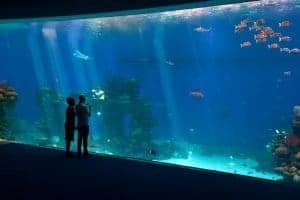 These halls are submerged at a depth of 12 meters under the sea, offering visitors a natural view of the coral reef’s spectacular beauty through huge plate glass windows.